Permaculture, although around since the 1970s in Australia, is still a fairly new idea over here. The word is a contraction of the words permanent, agriculture, and culture (interesting that agriculture, which means cultivation of the land, is so tightly tied to culture - without agriculture there is no culture!). The idea of permaculture is a completely sustainable agriculture, and more so culture. Sustainable means that there is no "garbage," that everything we need to live on comes and goes in a permanent, circular, mutually beneficial and dependent, and therefore WASTELESS cycle. The principle of agricultural permaculture is planting crops together that complement one another in a wildly complex and diverse composition that emulates nature, although it is man-made. These food forests work at every stratum of the vegetation, from low down mushrooms, herbs and flowers, to the next level of berry and hazelnut bushes, to higher up fruit and nut trees. This is not a new concept, though. But then - sometimes we need to revisit old ideas from a fresh perspective and a higher perch. Thanks to the suggestion of a friend, I recently read the book 1491 by Charles Mann and learned about milpas. 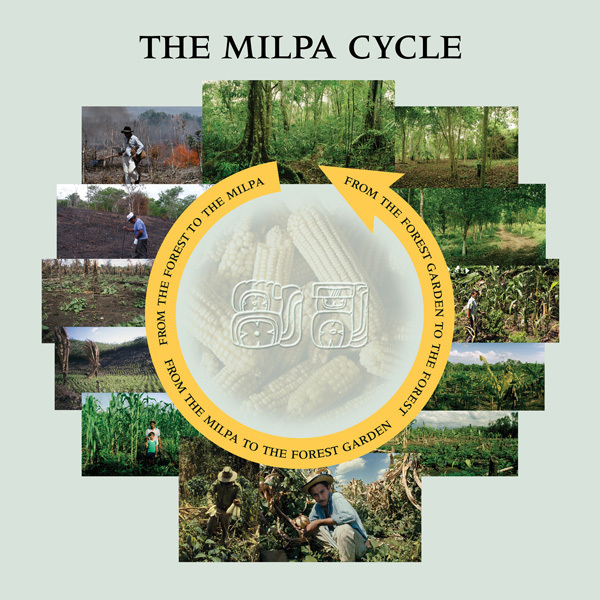 Milpas are South American planting compositions that comprise up to a dozen crops (maize, avocados, squashes and beans, melon, tomatoes, chilis, sweet potatoes, jicama, amaranth, and mucuna), which all "complement one another nutritionally and environmentally." Some milpas, I learned, have been in existence for four thousand years without depleting the soil!!! One of the problems of our conventional farming methods, which is exacerbated in monocultures, is the lack of diversity in crops, because a lack of diversity in the insect/grub/bird population follows it. This disconnect between agriculture and nature then depletes the soil on top of it all.